Sealift shipping falls into three broad categories: dry cargo ships or freighters, liquid cargo carriers or tankers, and passenger ships. During joint operations, dry cargo ships transport the equipment and supplies required to conduct and sustain the operation; tankers carry the refined petroleum, oils, and lubricants (POL) so critical to an operation's success; and passenger ships provide troop carrying (strategic or assault follow-on echelon [AFOE]) capability and noncombatant or sealift medical evacuation capability. 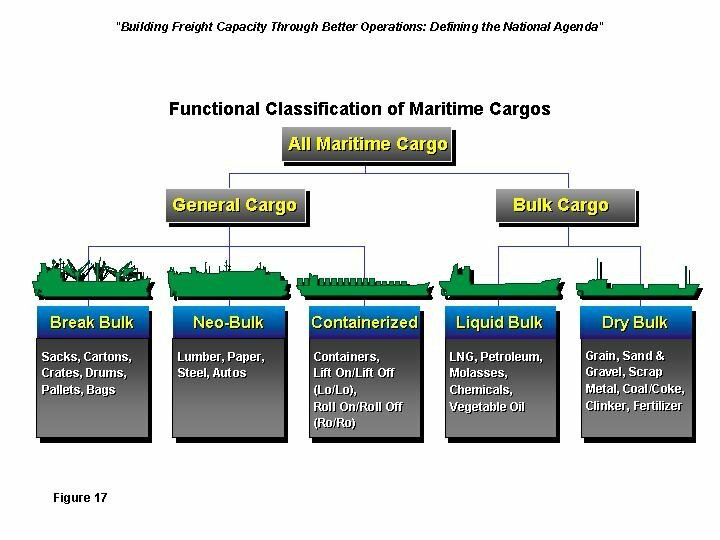 In general, a dry cargo ship is considered to be usable for military purposes if it has a minimum carrying capability of 2,000 long tons (LT) of cargo and the ability to carry, without significant modification, unit equipment, ammunition or sustaining supplies. At the present time, transport of cargo by water is, as a general rule, the most economical mode of transport available. In many instances, however, the cost differentials between sea and land transport, or between sea and air transport, in combination with the time differentials similarly involved, render land or air transport preferable to sea transport. If the cost of sea transport can be substantially reduced, the use of sea transport in preference to land or air transport would be increased to the advantage of the substantial maritime investment in the nation, as well as to the long term military advantage of the country. In the mid-1800s, the cargo ship generally still had her sailing ship-type flush deck, except for a central bridge built across the tops of the paddle boxes of the paddle boat steamers. This was a convenient place from which the Captain and watch keepers could control the ship, though the steering wheel and the helmsman were still exposed on the upper deck aft. Subsequent designs included a poop deck to raise the helmsman and steering wheel to a safer level. At the same time a forecastle was introduced in the forward area to provide living quarters for the crew, without losing valuable cargo space. And the bridge was raised to provide a better command post. Thus the typical flush-decked cargo carrier evolved into the typical well-decked carrier of the 1900s. Until the 20th Century, ships generally, were all-purpose cargo vessels, with very little specialisation. All cargoes were carried in general purpose holds, or on deck. The first exception was tank vessels, which first appeared in the 1880s. Modern commercial vessels are designed and built to carry specific cargo types. The names given to the various vessel types reflect the type of cargo for which they are designed and built to carry. Usually, the rear part of the ship includes a deck superstructure with the navigating bridge of the ship and the means necessary for the propulsion of the ship, including machinery and fuel tanks, while the front part of the ship includes the stem and store rooms, if any. The central part of the ship includes the hold, which is constructed in accordance with the specific type of goods to be transported. The hold may thus be constructed specifically for the transport of one specific type of goods, including e.g., cooled goods, liquid gas, dry cargo, oil or containers. Particularly in former times, the possibilities of utilizing transport ships for carrying combinations of the above-mentioned types of goods were very limited. In conventional large transport ships such as tankers, bulk carriers, container ships, LNG carriers and car carriers, a construction is used wherein ballast is loaded onto the ship in order to prevent problems associated with a shallow draft in the case of an empty load, and in order to control the center of gravity. In other words, if the draft is shallow, problems occur in that; (1) the degree of hogging during navigation is large, and the shearing force and longitudinal bending moment applied to the hull are also large, (2) during navigation, the ship is exposed to the impact of waves striking the ship bottom (so called "slamming"), (3) the propeller cannot be immersed fully, and emerges from the water, which causes a decrease in the propulsion performance, and an increase in the load fluctuation on the propeller and the main engine (causing so called "propeller racing"), and (4) the rudder cannot be submerged sufficiently, causing maneuverability to worsen. In order to resolve these problems, ballast is loaded onto the ship to lower the draft. Moreover, in this type of large transport ship, in order to ensure a large freight capacity and reduce construction costs, it is standard for the ship bottom to be a flat planar shape. Furthermore, in a ship hull for which the center of gravity tends to be high, because it is necessary to lower the center of gravity to improve the stabilizing capabilities of the hull, the center of gravity is adjusted by loading ballast into the ship bottom, and conversely, in a ship hull for which the center of gravity tends to be too low in an unloaded state, the center of gravity is adjusted by loading ballast at a high position, to raise the center of gravity of the ship. Furthermore, if the ship heels during loading, it is possible to control the balance of the ship by temporarily loading ballast as a counterweight. In general sea water is used as the ballast, but if the large transport ship takes on this sea water in a loading area, travels to another area of sea, and then dumps the sea water ballast into the sea so that cargo can be loaded at this other site, it is possible that marine species from the sea area in which the ballast was loaded can enter the sea at the other area, potentially changing the ecosystem. Ideas such as replacing the ballast while on the open sea, or sterilizing the ballast water before dumping, have been proposed as solutions to this problem, but these measures are insufficient to resolve this problem completely. Furthermore, the amount of ballast water depends on the type of ship, but is generally approximately 30% of the displacement of the ship, meaning that the ship carries an unnecessary and unpaid load when in an unloaded state. Consequently, fuel is wasted, which is also a problem from the viewpoint of energy conservation. It has long been recognized that oceanic cargo ships of conventional design sufficiently large for economic operation on long voyages lose much of those savings in loading and unloading costs and tie-up time; also in the limitation on ports accessible to them, primarily the major deep water ports. Moreover, not only does the typical ship's displacement type hull necessary for efficient safe crossings require an extreme draft for these huge vessels, but the shape and depth of the hull, together with the presence and arrangement of propulsion plants and other ship's machinery, quarters and gear, makes the resulting storage space configurations and arrangements quite ill-suited to the efficient and versatile utilization of the net tonnage hold capacity of the vessel, particularly for general cargo ships as distinguished from tankers wherein storage space configuration is obviously of lesser importance. A major effort to reduce loading and unloading costs is seen in the advent of containerized cargo ships and barges. However, with barges, speed is limited and travel time becomes excessive over long distances. Furthermore, a large container ship cannot enter many of the shallow-water ports, so that additional trans-shipping costs are incurred in those cases. Somewhat similar problems are encountered in the large roll-on, roll-off ships such as are used to transport automobiles and the like. The lighters-aboard-ship type vessels (referred to as LASH) permit servicing of shallow-water ports, such as upriver ports, but again, as in the case of container ships of conventional design, these also are not highly versatile and are incapable of fully utilizing hold space. All of these ships in the larger sizes are very expensive to build because of the multiple complex curvatures in virtually all portions of a displacement type hull as well as the requirements of complex framing, and providing for the accommodation and mounting of heavy and bulky power plants and other machinery, quarters, and ship's equipment. Moreover the requirements of a large on-board crew to man such vessels not only imposes expensive space and facilities requirements, but also adds operating costs both in terms of wages, fringes and supplies and in terms of lost cargo space otherwise available.